Applying an asphalt overlay to a concrete surface is a common practice. Asphalt paving contractors frequently use asphalt over concrete on interstates, state highways and city streets. Concrete provides an excellent base for the asphalt, which must have a well-compacted, stable foundation to yield superior results. This applies across the country- including Pennsylvania and the Camden area! Paving Over Concrete – Why? Although the majority of concrete surfaces can be paved with asphalt, under certain circumstances, the concrete does not have the integrity that asphalt needs. The following questions may be helpful when deciding whether your concrete surface is suitable for an asphalt overlay. 1. Are the concrete blocks or sections level? Concrete surfaces are constructed with individual sections. You have probably seen concrete driveways or roadways with one or more sections that are higher than the adjacent section, or those with sections that slant upwards or downwards at the edges. It does not take an earthquake to make concrete move in such a manner — anything that disturbs the soil beneath the concrete, such as extreme drought, floods, improper drainage or heavy freezes, can make the soil move, taking the concrete with it. 2. How large are the expansion joints? A space is typically left between adjoining blocks. This lets the concrete contract in winter and expand in summer without damaging it. These expansion joints can be a problem for an asphalt overlay. If the gaps are too large, it will not be long before you have large cracks in the asphalt that follow the lines of the expansion joints. 3. What is the overall condition of the concrete surface? An asphalt overlay should not be considered a “quick fix” for damaged concrete. Your satisfaction with the asphalt surface is proportional to the quality of the concrete. If the concrete has already begun to crumble, it will continue to deteriorate beneath the asphalt. If the concrete is separating along a major crack, the crack will most likely continue to spread. Although many of these problems can be repaired before the asphalt is applied, not addressing them can doom the overlay. It is also possible that your concrete surface may be so deteriorated that it is more economical to remove it and build a “total asphalt” project. Typically, if complete removal is required, it is an indication that the initial installation of the concrete was improper or that the concrete used was of extremely poor quality — although exceptions exist. Asphalt Pavement Solutions has been helping customers throughout Pennsylvania and the Camden area with all their asphalt needs for more than 35 years. We can apply an asphalt overlay and sealcoating while maintaining it throughout its life. 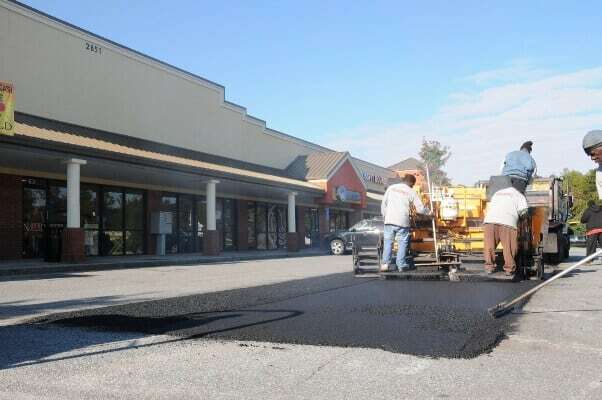 We offer pot hole repair, parking lot striping, concrete repair, installation of traffic signs, bollards and car stops. For a free quote, you can submit the form found on our website, or you can reach us by phone at 1-800-559-SEAL, 1-856-461-1710 or 1-856-544-3990. We are the “Premier Paving Contractors” in Philadelphia and Camden!